Grammy Award-winning English singer-songwriter Robert Palmer was born this day 19 January, 1949 in Batley, Yorkshire. He was known for his distinctive voice and the eclectic mix of musical styles on his albums, combining soul, jazz, rock, pop, reggae and blues. He found success both in his solo career and in the musical act Power Station, and had Top 10 songs in both the US and the UK. His iconic music videos by Terence Donovan for the hits “Simply Irresistible” and “Addicted to Love”, featured identically dressed dancing women with pale faces, dark eye makeup and bright red lipstick, which resembled the women in the art of Patrick Nagel, an artist popular in the 1980s. Sharp-suited, his involvement in the music industry commenced in the 1960s, covered five decades and included a spell with Vinegar Joe. In 1985 Palmer recorded the album Riptide which featured the single “Addicted to Love“. which has a memorable and much-parodied music video, directed by Terence Donovan, and In 1987, he won the Grammy Award for Best Male Rock Vocal Performance for “Addicted to Love”.The album also contained The singles “Hyperactive!” and his cover of Cherrelle’s “I Didn’t Mean to Turn You On”. In 1987 Palmer set up his own recording studio and released Heavy Nova in 1988, Palmer again returned to experimenting, this time with bossa nova rhythms, heavy rock and white-soul balladeering. He repeated his previous success of “Addicted to Love” with the video of “Simply Irresistible“, again with a troupe of female “musicians”. The ballad “She Makes My Day” also proved to be a hit in the UK. In 1989, he won a second Grammy for “Simply Irresistible” which would later be featured in the Tony Award winning musical Contact. Rolling Stone magazine voted Palmer the best-dressed rock star for 1990. The same year Palmer expanded his range even further for his next album, Don’t Explain, which featured the Bob Dylan penned single “I’ll Be Your Baby Tonight”, in a collaboration with UB40. Marvin Gaye cover “Mercy Mercy Me”. Throughout the 1990s, Palmer ventured further into diverse material and his 1992 album Ridin’ High was a tribute to the Tin Pan Alley era. Sadly Palmer, who was a heavy smoker, died in Paris, France, from a heart attack on 26 September 2003 at the age of 54. He was survived by his parents, Leslie and Anna Palmer, his girlfriend Geraldine Edwards, his brother, Mark Palmer, and his children, James, Jane, Anthony, Anna and Martin. Formula One racing Driver Jenson Button MBE was born on this day 19 January in 1980. He is currently signed to McLaren, and was the 2009 World Drivers’ Champion. He began karting at the age of eight and achieved early success, before progressing to car racing in the British Formula Ford Championship and the British Formula Three Championship. He first drove in Formula One with the Williams team for the 2000 season. The following year he switched to Benetton, which in 2002 became Renault F1, and then for the 2003 season he moved to BAR. They were subsequently renamed Honda for the 2006 season, during which Button won his first Grand Prix in Hungary, after 113 races. Following the withdrawal of Honda from the sport in December 2008, he was left without a drive for the 2009 season, until Ross Brawn led a management buyout of the team in February 2009, and Button suddenly found himself in a highly competitive, Mercedes-engined car. He went on to win a record-equalling six of the first seven races of the 2009 season, and secured the 2009 World Drivers’ Championship at the Brazilian Grand Prix, having led on points all season; his success also helped Brawn GP to secure the World Constructors’ Championship. For 2010, he moved to McLaren, partnering fellow British racer and former world champion Lewis Hamilton. After finishing fifth for the team in 2010, Button finished the 2011 season as runner-up to World Champion Sebastian Vettel. Often referred to as “The Queen of Country Music,” The American singer-songwriter, author, multi-instrumentalist, actress and philanthropist Dolly Parton was born on this day January 19 in 1946). best known for her work in country music, she has appeared in movies like 9 to 5, The Best Little Whorehouse in Texas, Steel Magnolias and Straight Talk and is one of the most successful female country artists of all time.Dolly Parton was born in Sevierville, Tennessee, and began performing as a child, singing on local radio and television programs in the Eastern Tennessee area. By age nine, she was appearing on The Cas Walker Show on both WIVK Radio and WBIR-TV in Knoxville, Tennessee. At thirteen, she recorded the single “Puppy Love”, on a small Louisiana label, Goldband Records, and appeared at the Grand Ole Opry in Nashville, Tennessee.It was at the Opry where she first met Johnny Cash who encouraged her to go where her heart took her, and not to care what others thought. The day after she graduated from high school in 1964, Parton moved to Nashville taking many traditional elements of folklore and popular music from East Tennessee with her. Parton’s initial success came as a songwriter, writing two top ten hits with her uncle Bill Owens: Bill Phillips’s “Put it Off Until Tomorrow” and Skeeter Davis’ 1967 hit “Fuel to the Flame”. She also wrote a minor chart hit for Hank Williams Jr during this period. She had signed with Monument Records in late 1965, where she was initially pitched as a bubblegum pop singer, earning only one national-chart single, “Happy, Happy Birthday Baby,” . The label agreed to let Parton sing country music after her composition, “Put It Off Until Tomorrow,” as recorded by Bill Phillips went to number six on the country music charts in 1966. Her first country single, “Dumb Blonde” reached number twenty-four on the country music charts in 1967, followed the same year with “Something Fishy,” which went to number seventeen. The two songs anchored her first full-length album, Hello, I’m Dolly. For the next two years, she had a number of solo hits including her first number-one single, “Joshua.” and her signature song “Coat of Many Colors”, in addition to her duets she had successful singles, including “Jolene”. which was eleased in 1973 and topped the singles chart in February 1974, reaching No. 7 in the UK in 1976. From 1974 to 1980, she consistently charted in the country Top 10, with no fewer than eight singles reaching number one, and she also had her own syndicated-television variety show, Dolly! (1976–1977). It was also during this period that Parton began to embark on a high profile crossover campaign, attempting to aim her music in a more mainstream direction outside country music. In Her 1976 album All I Can Do, Parton began taking more of an active role in production, and began specifically aiming her music in a more mainstream, pop direction. Her first entirely self-produced effort, 1977′s New Harvest … First Gathering, highlighted Parton’s pop sensibilities and contained covers of the pop and R&B classics “My Girl” and “Higher and Higher”. In 1978 Parton won a Grammy Award for Best Female Country Vocal Performance for her Here You Come Again album. She continued to have hits with “Heartbreaker” (1978), “Baby I’m Burning” and “You’re the Only One” (both 1979), all of which charted in the pop singles Top 40, and all of which also topped the country-singles chart. Parton’s commercial success continued to grow during 1980, with three number-one hits in a row: the Donna Summer-written “Starting Over Again”, “Old Flames Can’t Hold a Candle to You”, and “9 to 5,” which topped the country and pop charts in early 1981 and was the theme song to the feature film Nine to Five (1980) in which Parton starred alongside Jane Fonda and Lily Tomlin. Parton’s singles continued to appear consistently in the country Top 10 between 1981 and 1985. She also explored new business and entertainment ventures such as her Dollywood theme park, that opened in 1986 in Pigeon Forge, Tennessee. By the mid-1980s, her record sales were still relatively strong, in 1987 she released the album Trio (1987) to critical acclaim. The album spent five weeks at number one on Billboard’s Country Albumschart. Throughout the 1980′s 90′s and 2000 ownwards Dolly has continue to enjoy ongoing success. As well as her Successful Business Ventures, such as Dollywood, her many televison and film appearances and her varied charity work, she has also won many awards and honours, including eight Grammy Awards and a total of 45 Grammy Award nominations, At the 2011 Grammies she was given a Lifetime Achievement Award and at the American Music Awards she has won three awards, At the Country Music Association, she has received 10 awards and At the Academy of Country Music, she won seven awards and is one of only six female artists (including Reba McEntire, Barbara Mandrell, Shania Twain, Loretta Lynn, and Taylor Swift), to win the Country Music Association’s highest honor, Entertainer of the Year. She has also been nominated for two Academy Awards and a Tony Award. She was also awarded a star on the Hollywood Walk of Fame for Recording in 1984. Dolly wasalso inducted into the Grand Ole Opry in 1969, and in 1986 was named one of Ms. Magazine’s Women of the Year. In 1999, Parton received country music’s highest honor, an induction into the Country Music Hall of Fame. She received an honorary doctorate degree from Carson-Newman College (Jefferson City, Tennessee) in 1990. This was followed by induction into the National Academy of Popular Music/Songwriters Hall of Fame in 2001. In 2002, Parton ranked number four in CMT’s 40 Greatest Women of Country Music. On December 3, 2006, Parton received the Kennedy Center Honors from the John F. Kennedy Center for the Performing Arts for her lifetime of contributions to the arts. On November 16, 2010, Parton accepted the Liseberg Applause Award, the theme park industry’s most prestigious honor, on behalf of Dollywood theme park during a ceremony held at IAAPA Attractions Expo 2010 in Orlando. She is also a keen conservationist and In 2003, her efforts to preserve the bald eagle through the American Eagle Foundation’s sanctuary at Dollywood earned her the Partnership Award from the U.S. Fish and Wildlife Service and Parton also received the Woodrow Wilson Award for Public Service from the Woodrow Wilson International Center for Scholars of the Smithsonian Institution at a ceremony in Nashville on November 8, 2007. For her work in literacy, Parton has received various other awards including: Association of American Publishers – AAP Honors Award in 2000, Good Housekeeping Seal of Approval in 2001, American Association of School Administrators – Galaxy Award in 2002, National State Teachers of the Year – Chasing Rainbows Award in 2002 and the Parents as Teachers National Center – Child and Family Advocacy Award in 2003. I am a big fan of American author, poet, editor and literary critic Edgar Allan Poe who was born January 19, 1809 in Boston, Massachusetts, so I thought I’d mark the anniversary. He was orphaned young when his mother died shortly after his father abandoned the family & was taken in by John and Frances Allan, of Richmond, Virginia, but they never formally adopted him. He attended the University of Virginia for one semester but left due to lack of money. After enlisting in the Army and later failing as an officer’s cadet at West Point, Poe parted ways with the Allans’. His publishing career began humbly, with an anonymous collection of poems, Tamerlane and Other Poems (1827), credited only to “a Bostonian”. Poe switched his focus to prose and spent the next several years working for literary journals and periodicals, becoming known for his own style of literary criticism. His work forced him to move among several cities, including Baltimore, Philadelphia, and New York City. In Baltimore in 1835, he married Virginia Clemm, his 13-year-old cousin. In January 1845 Poe published his poem, “The Raven”, which tells of a talking raven’s mysterious visit to a distraught lover, who is lamenting the loss of his love, Lenore and it traces the man’s slow descent into madness, which the raven seems to further instigate with its constant repetition of the word “Nevermore”. The poem has a supernatural atmosphere and also makes use of a number of folk and classical references and became a huge success. Poe claimed to have written the poem very logically and methodically, intending to create a poem that would appeal to both critical and popular tastes, as he explained in his 1846 follow-up essay “The Philosophy of Composition”. The poem was inspired in part by a talking raven in the novel Barnaby Rudge: A Tale of the Riots of ‘Eighty by Charles Dickens. Its publication made Poe widely popular in his lifetime, although it did not bring him much financial success. Soon reprinted, parodied, and illustrated, critical opinion is divided as to the poem’s status, but it nevertheless remains one of the most famous poems ever written. He began planning to produce his own journal, The Penn (later renamed The Stylus), though he sadly passed away On October 7, 1849, at age 40 in Baltimore; the cause of his death is unknown and has been variously attributed to alcohol, brain congestion, cholera, drugs, heart disease, rabies, suicide, tuberculosis, and other agents. Poe is considered part of the American Romantic Movement and is remebered for his tales of mystery and the macabre, Poe was one of the earliest American practitioners of the short story and is considered the inventor of the detective fiction genre. He is further credited with contributing to the emerging genre of science fiction.and his works influenced literature in the United States and around the world, as well as in specialized fields, such as cosmology and cryptography. Poe and his work appear throughout popular culture in literature, music, films, and television. A number of his homes are dedicated museums today. The Mystery Writers of America present an annual award known as the Edgar Award for distinguished work in the mystery genre. The award is named after this author. French Post-Impressionist painter Paul Cézanne was Born 19th January 1839 in Aix-en-Provence, France, At the age of ten Paul entered the Saint Joseph school, where he studied drawing under Joseph Gibert, a Spanish monk, in Aix. In 1852 Cézanne entered the Collège Bourbon (now Collège Mignet), where he met and became friends with Émile Zola, who was in a less advanced class, as well as Baptistin Baille—three friends who would come to be known as “les trois inséparables” (the three inseparables). He stayed there for six years. From 1858 to 1861, complying with his father’s wishes, Cézanne attended the law school of the University of Aix, while also receiving drawing lessons. Hhe committed himself to pursuing his artistic development and left Aix for Paris in 1861, encouraged by Zola, who was already living in the capital at the time. In Paris, Cézanne met the Impressionist Camille Pissarroand Over the course of the following decade they went on many landscape painting excursions together, in Louveciennes and Pontoise.Cézanne’s early work is often concerned with the figure in the landscape and includes many paintings of groups of large, heavy figures in the landscape, imaginatively painted. His work laid the foundations of the transition from the 19th century conception of artistic endeavour to a new and radically different world of art in the 20th century. Cézanne can be said to form the bridge between late 19th century Impressionism and the early 20th century’s new line of artistic enquiry, Cubism. The line attributed to both Matisse and Picasso that Cézanne “is the father of us all” cannot be easily dismissed. Cézanne’s often repetitive, exploratory brushstrokes are highly characteristic and clearly recognizable. He used planes of colour and small brushstrokes that build up to form complex fields. The paintings convey Cézanne’s intense study of his subjects. 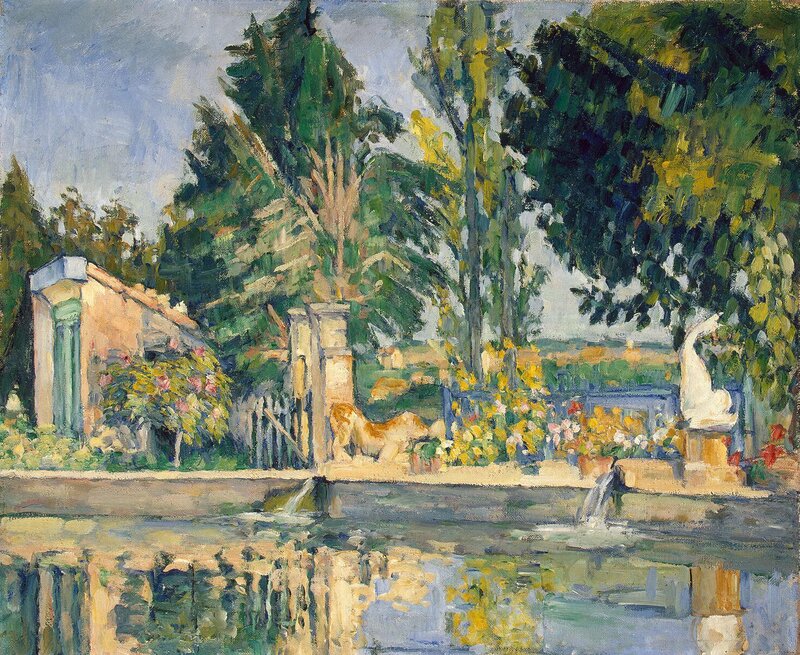 Cezanne sadly passed away, on 22nd October 1906 after he was caught in a sudden storm for two hours while painting in a nearby field and contracted pneumonia. He is buried at the old cemetery in his beloved hometown of Aix-en-Provence.